Do not mess with Toni Braxton or she will come after you, just ask her younger sister, Tamar. 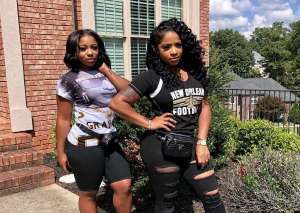 Fans of the hit show Braxton Family Values are aware that the sisters love and support each other through it all, but they also enjoy pulling crazy pranks. Tamar has been “going after” Toni on social media by poking fun at her relationship with Bryan “Birdman” Williams. Vincent Herbert’s estranged wife has been telling everyone that Toni and the Young Money rapper/mogul eloped. Toni recently forced Tamar to delete one of her “Toni Is Married To Birdman” posts on Instagram. And she is taking it a step further. Toni is having the last laugh by posting this hilarious wanted poster of Tamar where she revealed that, like a child, she is being punished. Fans are happy to see the Braxton sisters having fun and laughing during this difficult time. Beyonce Stuns In An Elegant Emerald Green Gown While Attending Serena Williams' Wedding!